All month long, I've been sharing some of the photos from our holiday photo session on Instagram. As much as I love all of the pics I've been posting, I wanted to give you a REAL look behind-the-scenes of family photos with a 2.5-year-old and 10-month-old. Let me just say, it's not glamorous by any means. Leading up to shoot day, I had so much fun coordinating outfits for us and the boys. But, on the day, I was reminded that my boys love to play in the dirt and their backup outfits were quickly a no-go as soon as we got outside for pictures in our backyard. It'll probably be a good idea to bring two outfits and start with the one that's OK to play in next time. In true toddler fashion, Ryan was not cooperating at all during photos. He typically doesn't like taking pics and shies away as soon as he knows he's on camera anyway... what actually worked with him was for hubby and I to leave the room so Ryan could be alone with the photographer. Some of his best solo photos (as well as a few with his baby brother) were when us parents weren't around. It gave him the time to warm up to it on his own, without us hovering or making expectations or projecting our nerves onto him. At 10 months old, baby brother Leo was completely unpredictable! He had his happy moments, but also his whining and crying spells throughout. It's hard to blame him because he's a teething little monster right now & he wanted his usual routine of uninterrupted access to nurse with mom. Daddy had to work that day, but took a couple of hours off for the shoot... but with the unpredictability of takings pictures with two little ones, our session took longer than I promised him it would, so he was as antsy as the boys were to be done with it. Next year, we'll try to take the entire day off as a family. As for me, I felt a hot mess throughout the entire session! There was a lot of running after one (or both) of the boys to wrangle them back into the room, calming meltdowns from all parties, and coming up with ideas to entertain the boys to get the best pics. I felt completely drained and out of it, and it was probably because I was putting too many expectations on my shoulders. In the end, we made it as fun as we could and went to our favorite lunch spot Houston's in Pasadena afterward to celebrate it being over and done. When we got our photos back, I wasn't surprised to see that after all of those hours, there was literally one usable picture of the four of us and even the one doesn't have us all looking at camera.. which is totally fine! Lesson learned—it's super difficult to get four adults all to look decent in the same pic, let alone trying to get two adults who are busy entertaining two uncooperative littles AND make sure all four look decent... slim chance! While there was only one favorite family picture, I did think there were a ton of great photos of the boys, and me with the boys (which rarely happens! ), or daddy with the boys. These photos will be great memories of the day, the holidays, and Leo's first Christmas! And, here's our 2017 family Christmas card below! 1. Choose the right photographer. There are so many photographers out there, and it's important to find yours. If you thought choosing a photographer for your wedding was tough, it's a completely different approach when looking for a family photographer. Do you want portrait photos (the traditional formal poses) or more of a lifestyle session (where the photographer captures your everyday life and sneaks in some formal poses along the way)? Take a look on Pinterest for the styles that call most to you, and find a photographer who echoes those styles. After you figure out your style, you'll want to find someone who either has kids or has worked with little ones enough to be able to roll with the chaos. We decided to hire a photographer who's worked with our family in the past for the best shot at a successful shoot. 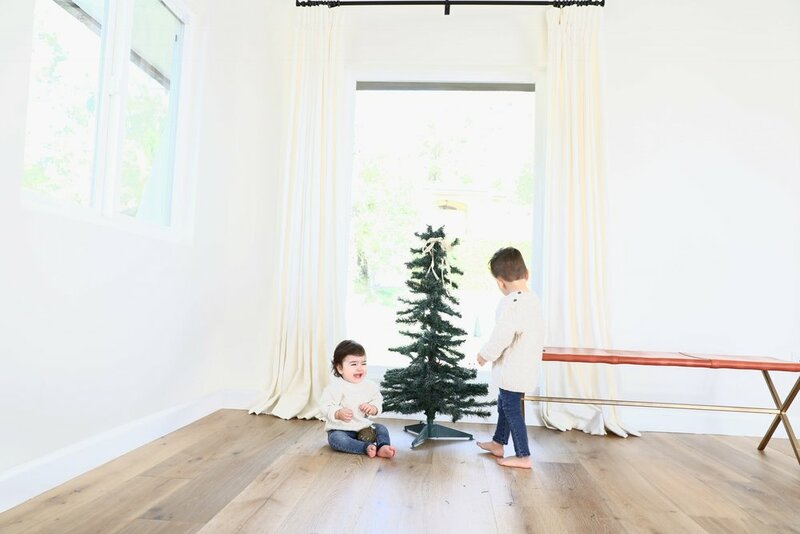 It also helped that the talented Aris Megerdichian of Ris Photography is a daddy to two adorable littles himself, and so, was patient, understanding, and ready to tackle the job! 2. Set aside your expectations. If you've spent any time on Pinterest hunting for the perfect family photo outfits, you've probably conditioned yourself to believe that every snapshot is going to be the most amazing family photo ever. The truth is, kids are unpredictable! And we all know that's part of the fun of having these little people in our lives. There are plenty of years for the perfectly orchestrated family portraits, but only a few where you can memorialize these early years, so embrace it. If you expect to get ONE holiday-card worthy portrait and a dozen fun photos of the kids, you'll be in the right mindset for success. Making a big deal about "smiling for the camera" is exhausting for you and demoralizing for the kids. Instead of putting all of the focus on the camera, plan an activity to do while the photographer visits. It doesn't have to be something complicated, either. If you're inside, you can plan to bake cookies or read some silly new stories. If you're outside, play a game of hide and seek. A good photographer will snag a few fun photos of the family playing together, and then guide everyone together for a quick, smiley post-game portrait. The important thing is to keep surroundings familiar and fun for the kids, and the smiles will come naturally. They'll also start to feel more comfortable with the photographer and may even start cheerily modeling for him or her by the end of your session! Did you have a similar experience with your family photos? I think it's important to share our REAL experiences with other moms because we can get so caught up in creating the image of perfection... so share the good, the bad, and the ugly in the comments!